When you have so many worms what do you need? A worm house of course! This week children built houses for worms from sticks, using mud kitchen bowls as the roof and populated their houses with more worms than you could ever imagine. It was fabulous to see them initially working together to work out what they needed and how they could construct the houses. When they had finished they proudly showed an educator but said they could only find one worm. The educator helped them think where the worms might be hiding and so the great worm hunt began. They looked in the mud kitchen, they looked high and low and eventually someone though of looking under the tree stumps, and there they were, in their dozens! A couple of worms even joined us for lunch, they were put safely just outside the log circle of course, after all we didn’t want the worms to eat all the soup! The children have enjoyed creating things with clay this week. One of the educators showed the children how to make a rose. The children were mesmerised by how each petal was stuck onto a stick and gradually became a flower. Then they set about making their own creations and goodness me, what imaginations. 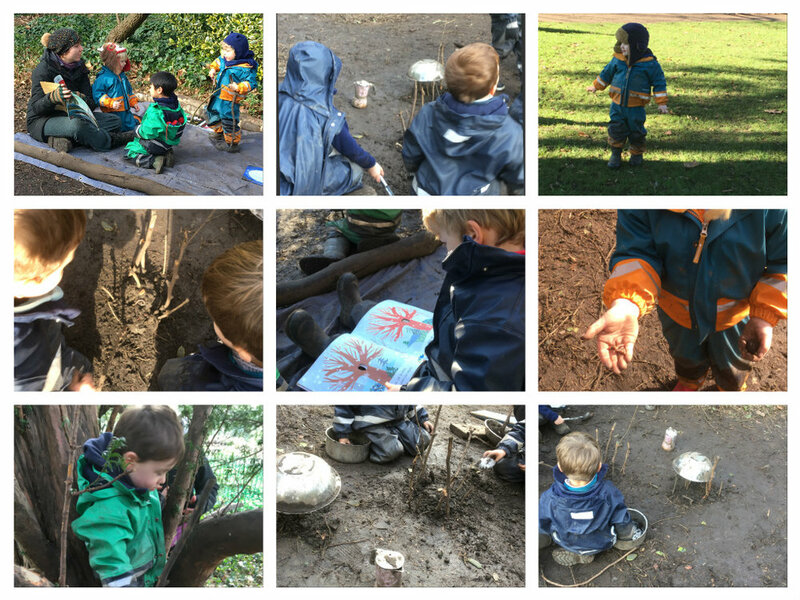 There were islands, trees, dinosaurs, flowers and a complete model of forest school including our log circle and climbing tree. Later in the week some of the children recreated our weekly cooking lesson but this time in the forest. The ‘cookery teachers’ set up the kitchen, arranged the pans and then invited their friends and some educators to join them to learn how to cook chocolate mud pancakes. They explained all the steps and we followed them carefully. As the play progressed so did he design of the kitchen. The children added cable reels and then a plank to make a shelf, followed by more pots and pans and of course an oven. It was fascinating to watch them act out something they have experience of, remembering key phrases and words they have heard in the weekly cookery lesson and applying this to their play.